There are all kinds of father/son bonding trips. Spencer and his elderly father have fought for years and they're finally getting through to one another. It's just that it happens during a Martian invasion. While people are being vaporized all around them, they reach a breakthrough. Now they've found shelter in a small building only to discover they're not alone. It seems there are more dangers than those that came from outer space as they encounter a madman with a gun. 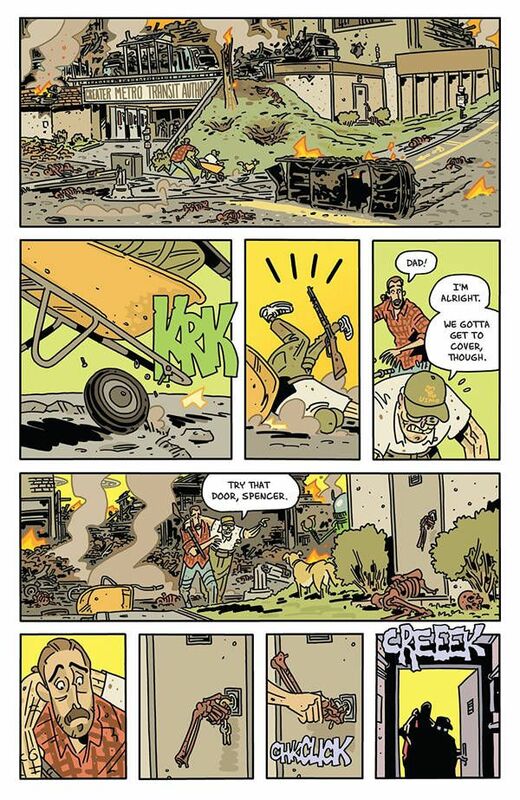 Mars Attacks has a healthy amount of comedy and it always brings a laugh, however this issue packs quite a punch. First there's the guy with the gun. He's holed up in a bunker, which could easily provide for a few people. Under normal circumstances that would be the case, but the Martian invasion has shattered this man's mind. You can tell this from the moment you lay eyes on him. Artist Chris Schweizer gives this guy a crazed look. He could snap at any moment. Sweat is pouring off him and his teeth are clenched. He's going to lose it at any moment, so the fact that he's holding an assault rifle is pretty terrifying. Just in case you needed proof that this guy is bad news, he hit a dog. That is a cardinal sin in all forms of storytelling. It also instantly makes his life forfeit. You can feel the tension rise steadily in this scene. This guy keeps saying that the Martians are going to hear them. Spencer and his dad have to leave because they're going to hear. It's a chilling sequence that only gets more harrowing with each turn of the page. I like how his speech is shown in wobbly word balloons, giving the impression that he's so on edge, he's having trouble putting the words together. This builds and builds to the point where the man is screaming his head off. His word balloons nearly take up the entire panel as he yells, “They'll hear you!” at the top of his lungs. I found myself pleading with him in my head to be quiet because I just knew the Martians were right around the corner. Adding to this is the eerie green light of the scene, like it's lit by glow sticks. 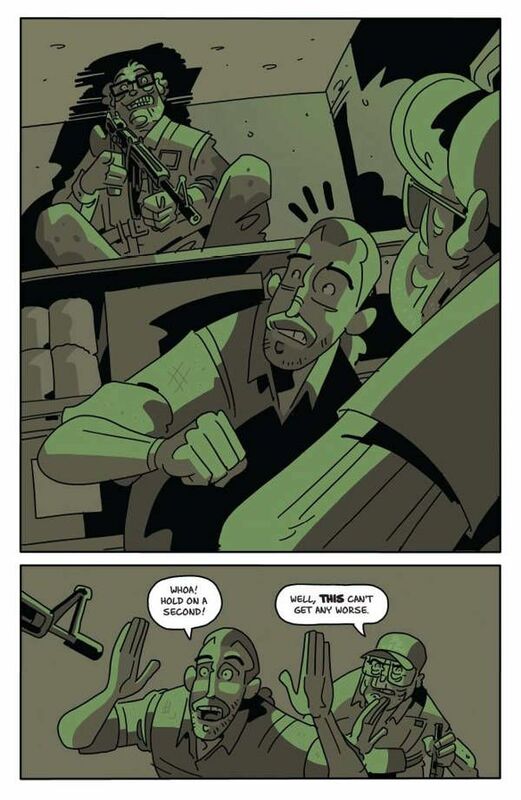 It creates this unsettling feeling as the shadows loom around the characters. When the Martians do eventually show up, it's in a burst of violent, red energy. They represent death and destruction. 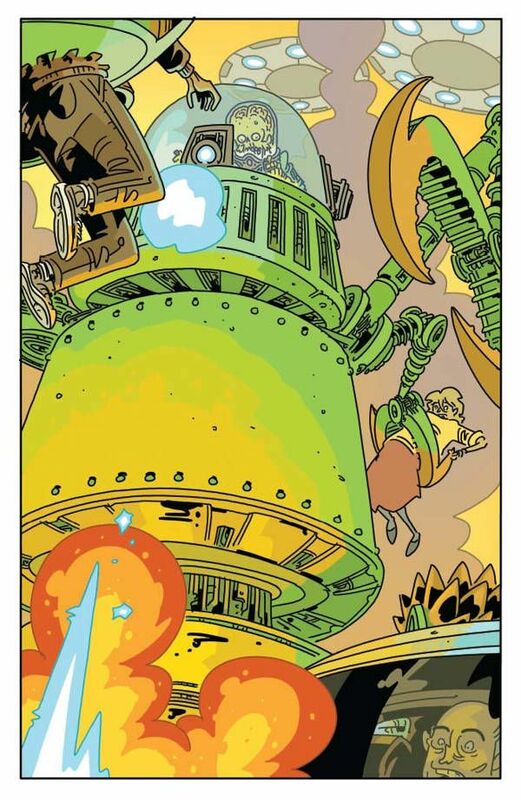 The pacing of Mars Attacks #4 is incredible. 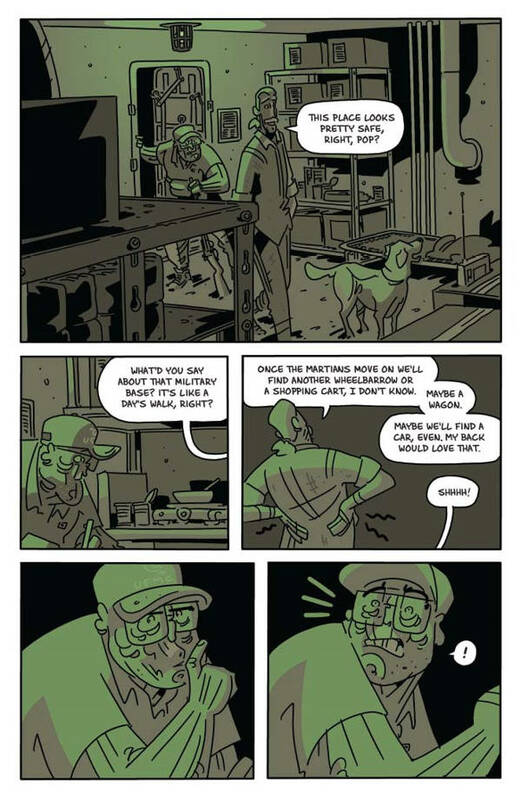 Writer Kyle Starks takes us through a range of emotions, from the tender conversations between Spencer and his dad to the nail-biting argument with the mad man in the bunker to the action-packed excitement of a fight with Martians. This issue has it all. 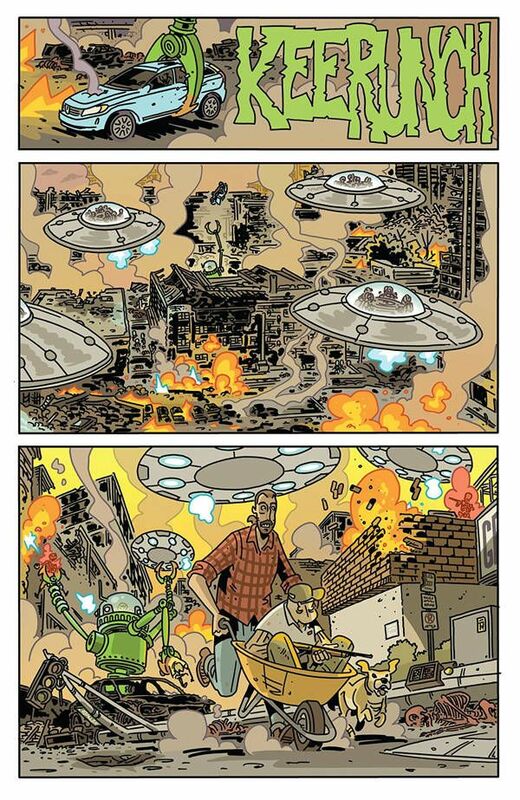 Sure, Mars Attacks is a campy property with some silly elements, but this comic shows that it is capable of so much more than that. It's really great stuff.